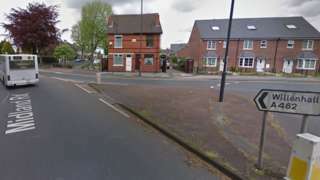 A 59-year-old man suffered serious head injuries and died at the scene after he was hit by car. M40 Warwickshire southbound severe accident, between J13 for A452 and J12 for B4451. M40 Warwickshire - One lane closed on M40 southbound between J13, A452 (Bishop's Tachbrook) and J12, B4451 (Gaydon), because of an accident. M42 Leicestershire southbound severe accident, between J11 for A42 and J10 for A5. M42 Leicestershire - One lane closed on M42 southbound between J11, A42 (Burton Upon Trent) and J10, A5 (Tamworth), because of an accident. 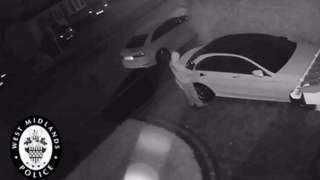 This footage from West Midlands Police shows two men pulling up outside a victim's house and stealing a car without needing to see the owner's keys. A53 Staffordshire both ways severe accident, between B5026 Eccleshall Road and B5415. A53 Staffordshire - A53 Market Drayton Road in Loggerheads closed in both directions between the B5026 Eccleshall Road junction and the B5415 junction, because of an accident. M42 Worcestershire - M42 lane closed on exit slip road northbound at J2, A441 (Alvechurch), because of a broken down vehicle. M6 Staffordshire southbound severe disruption, between J13 for A449 and J12 for A5. M6 Staffordshire - One lane closed on M6 southbound between J13, A449 (Stafford South) and J12, A5 (Gailey), because of a broken down vehicle. Traffic is coping well. A50 Staffordshire both ways severe accident, at Derby Street. 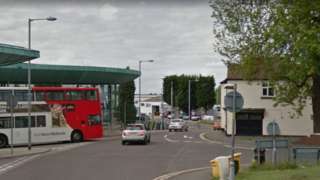 A50 Staffordshire - A50 Lichfield Street in Hanley closed and queuing traffic in both directions at the Derby Street junction, because of an accident involving two vehicles. Police directing traffic. M5 Worcestershire northbound severe disruption, at J4 for A38 Bromsgrove. M5 Worcestershire - One lane closed and slow traffic on M5 northbound at J4, A38 (Bromsgrove), because of a broken down vehicle. The woman was taken to hospital where her condition is stable, say police. 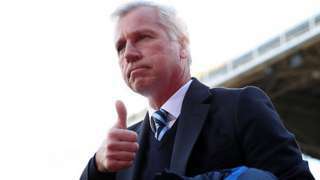 Alan Pardew describes the managerial position at West Brom as "an attractive job" after confirming he has held talks about the role. A5191 Shropshire both ways severe accident, at Longden Coleham. A5191 Shropshire - A5191 Coleham Head in Shrewsbury blocked and slow traffic at the Longden Coleham junction, because of an accident. 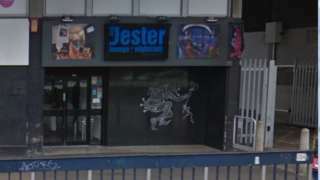 One man was taken to hospital with a gunshot wound and another suffered serious head injuries. M6 Staffordshire northbound severe disruption, between J11 for A460 and J12 for A5. M6 Staffordshire - One lane closed on M6 northbound between J11, A460 (Cannock) and J12, A5 (Gailey), because of a broken down vehicle. Traffic is coping well. M6 West Midlands southbound severe disruption, between J7 for A34 and J6 for A38. M6 West Midlands - One lane closed and slow traffic on M6 southbound between J7, A34 (Great Barr) and J6 A38(M) Aston Expressway, because of a police incident. M6 West Midlands southbound severe disruption, at J10 for A454. M6 West Midlands - M6 in Walsall lane closed on entry slip road and slow traffic southbound at J10, A454 (Wolverhampton), because of a broken down vehicle. M42 Worcestershire southbound severe disruption, between J2 for A441 Alvechurch and J1 for A38. M42 Worcestershire - One lane closed on M42 southbound between J2, A441 (Alvechurch) and J1, A38 (Bromsgrove), because of a broken down vehicle. Traffic is coping well. M6 Staffordshire - One lane closed and slow traffic on M6 southbound between J13, A449 (Stafford South) and J12, A5 (Gailey), because of animals on the road. 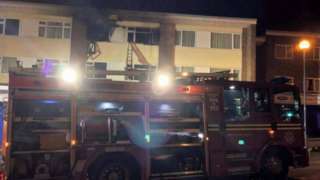 They were taken to hospital after a fire started in the early hours of Sunday. The latest news, sport, travel and weather across the West Midlands and south Cheshire on Friday 24 November.